Happy Spring - The Nuclear Wintour Is Now Officially Over. 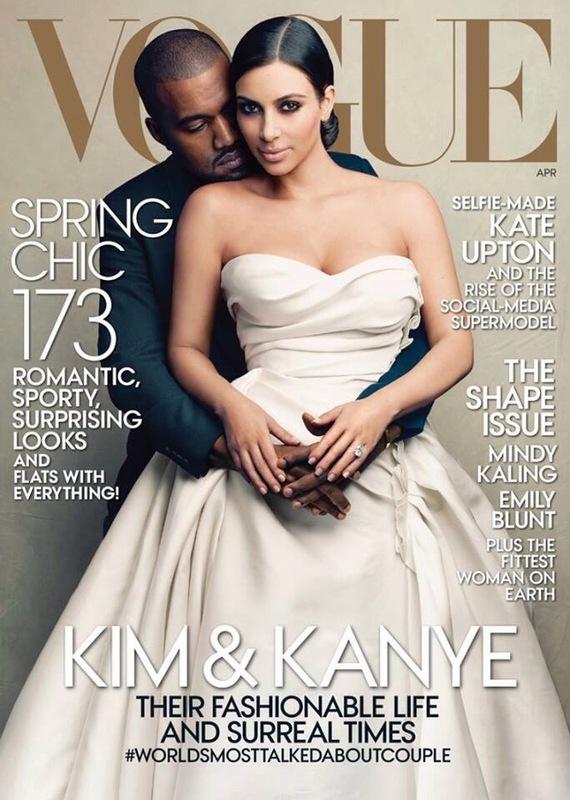 Everything You Need To Know About The Kim And Kanye Vogue Cover But Were Afraid To Ask. During Anna Wintour's reign as editor in chief @ Vogue, it was whispered that she had effectively banned Kim Kardashian from ever appearing on the cover of the magazine. It's what you'd call an open secret in the worlds of Conde Nast and high fashion. With all that in mind then, no one was more surprised that I was to see this cover shot in my FB news feed a few minutes ago. Could it be that in her new role as artistic director of Conde Nast, Anna has softened - from when she was famously known as 'Nuclear Wintour'? More likely she has jumped on the Kardashian (and Ryan Seacrest Productions) bandwagon. Sure does seem that way. Maybe she sees a circulation boost and beaucoup dollar signs? It will be interesting though to see whether or not this issue will actually sell, whether or not the Voguettes will buy on to the Kim and Kanye show. I guess we'll see. Hmmm .